49 Crownridge Drive, Bedford (MLS® 201819998): Build your dream home on the newest and most beautiful cul de sac in Bedford West with premium builder Homes By Highgate. 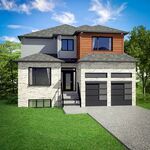 This stunning 5 bedroom home is starting construction now and still allows time for you to customize your finishes. This treed lot is on the newest premium cul de sac in Cascades, surrounded by beautiful trees and walking trails. Enjoy the great neighbourhood feel that West Bedford has to offer with so many convenient amenities near by.